Got a title in mind, but you aren’t seeing it on our website? 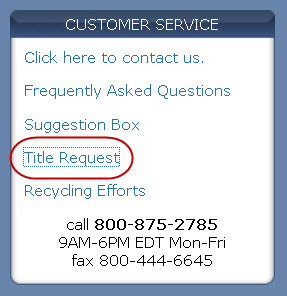 Request it with our Title Request tool, accessible from our homepage under “Customer Service” in the right column. Upon clicking this link, a form will appear. Simply complete and submit the form, and (after receiving a confirmation email) one of our Collection Development Specialists will work to fulfill your request. 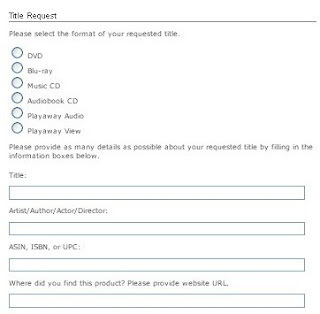 To ensure we find the exact title you're requesting, be sure to provide as many details as you can on the form. Requesting multiple titles? 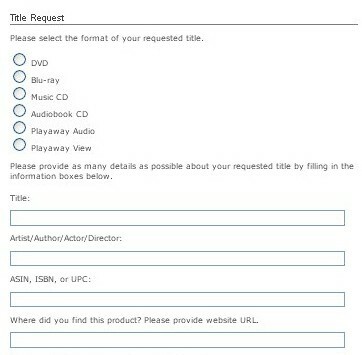 Click "Submit and Request Another Title" to fill out additional request forms. Have you tried the Title Request tool? We’d love for you to share your feedback. Got an idea of how we can better aid your browsing and selecting? Share your thoughts in the comments section below!